The second slot made by designers Rabcat for Microgaming’s Quickfire platform, Microgaming’s new slot, Scary Friends, is a video slot that fully encompasses the social gaming element of many of today’s new games. There's a $40,000 Jackpot to be Won! Gone are the fancy frills and flourishes you find on many online slots or land-based adaptations; in comes a sleek interface that looks like it’s come straight out of an IKEA catalogue. And the betting levels and wins are definitely on the more ‘casual’ side. For example, five ‘10’ symbols across the reels pays out $20 when playing at the max. bet of $2 a coin. Having said that, five Wild logos across the reels does pay out a $40,000 jackpot. 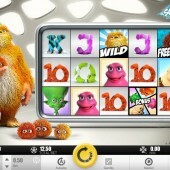 Visually everything is very crisp, as you’d expect from Microgaming’s Quickfire platform. The idea is that the games under the Quickfire banner translate well between online and mobile, and that’s exactly how Scary Friends feels – like a game custom-made for your tablet. There’s even a mobile-style ‘Spin’ button in the center of the game-screen, while there are handy Max Bet and Autoplay buttons conveniently placed. In terms of symbols there are 10-through-King icons that look like exotic snakes, plus four different kinds of bug-eyed monster. The symbols really do make it feel like a spin-off slot of the popular Monsters Inc movie franchise. The Big Furry is the Big Wild! 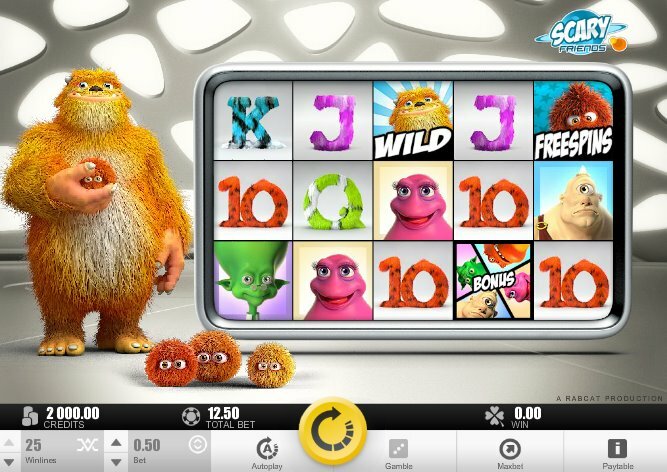 At the side of the reels stands our main man – a huge, orange, furry monster who looks like he’s stepped out of Monsters Inc. – and he’s accompanied by several hairy minions who leap about whenever you hit a winning combo. Our big hairy hulk also acts as the game’s Wild, substituting for all symbols other than the Scatters. Earn up to 14 Free Spins! The fairly straightforward ‘Free Spins’ logo triggers – yep, you guessed it – a free spins bonus round when you hit three or more across the reels. Anything from 5 to 14 spins can be yours. The Bonus icon, meanwhile, triggers a feature bonus which starts as a Pick ’em Bonus: simply choose a monster from four available and they will be entered into the monster endurance race. If your chosen grizzly pal finishes 1st, 2nd or 3rd you’ll bag yourself a cash prize. If you enjoy the slick gameplay of Scary Friends, make sure you hunt out the aforementioned myth-themed slot, The Legend of Olympus, with its similar simple reels, easy-to-access buttons and animated reels. However, if it’s cuddly creatures you’re after, you could do far worse than get your trigger fingers on Leander’s nutty slice of monster mayhem, Glutters.